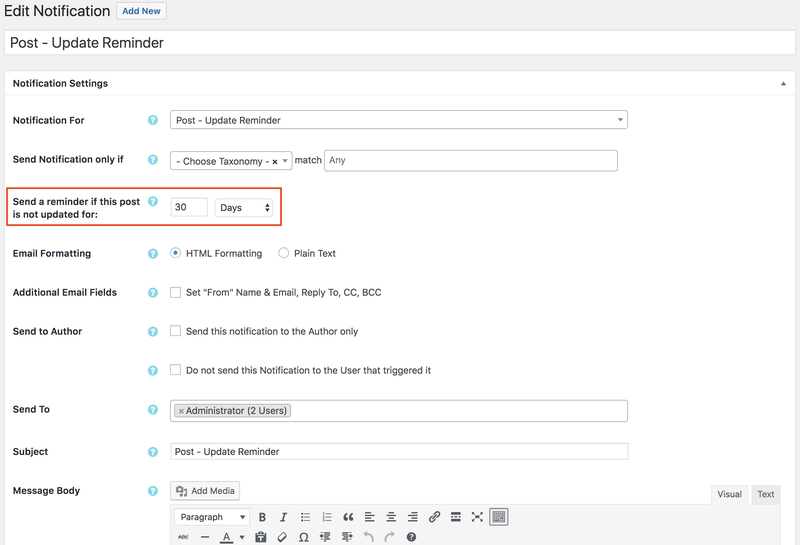 Reminders is a premium add-on for Better Notifications for WordPress. You can purchase it here. The Better Notifications for WordPress Reminders add-on allows you to send a notification if a user hasn’t update a post, page, or custom post type after a set number of days. It also allows you to send a transactional reminder notification if a user hasn’t logged in after a set amount of time. This add-on is useful if you run a site that requires users to update content on a regular basis. For example, if you run an educational institute, you might require that students update their homework or lab notes posts on a daily basis – with this add-on, reminding them to do that is easy. Selecting one of these new notifications will then allow you to set a number of hours, days, weeks, or months after which the notification should be triggered if a post / page / custom post hasn’t been updated. The amount of time entered must be in the form of a whole number (e.g. 2) and not numbers with decimal places (e.g. 0.5) in order to work correctly. A single notification will be sent once triggered and will not be repeated. E.g. If you want to let users know that they haven’t logged in for a month, then it will not repeat for every month that they haven’t logged in. Instead, it will only notify them after the first month. As a workaround, you can set-up multiple notifications to achieve this, with different durations. You can use any of the post, page, or custom post shortcodes as normal in the Subject and Message Body fields for the post, page and custom post type reminder notifications. You can view all the shortcodes currently available here. For the User Login Reminder notification, you can use the [user_last_login] shortcode to output the date and time they last logged in, which will be formatted in the date and time settings you have specified in WordPress > Settings. The time and date that a user last logged in is only recorded once the add-on has been installed and activated. As WordPress doesn’t record this information by default, a notification cannot be created to retrospectively show this information prior to when the add-on was installed. This add-on uses the built in WordPress cron to schedule reminder notifications and and as such, requires that the site is visited to ensure that the cron runs. More information about this standard WordPress behaviour is available to read on WordPress.org here. Additionally, I’ve written a support document which can help in troubleshooting and fixing WP Cron issues, available here.